Exactly a year ago,my friend Bimba and I saw an announcement about foraging in the forest with locals and then having a meal with them.This was about three hours away from Mumbai and we were pretty excited by the whole concept.The mountain air,the lush vegetation and the thrill of discovering something new,all seemed to beckon.Unfortunately it rained very,very heavily and the thought of poor network connectivity in such a situation made us give up our adventure. 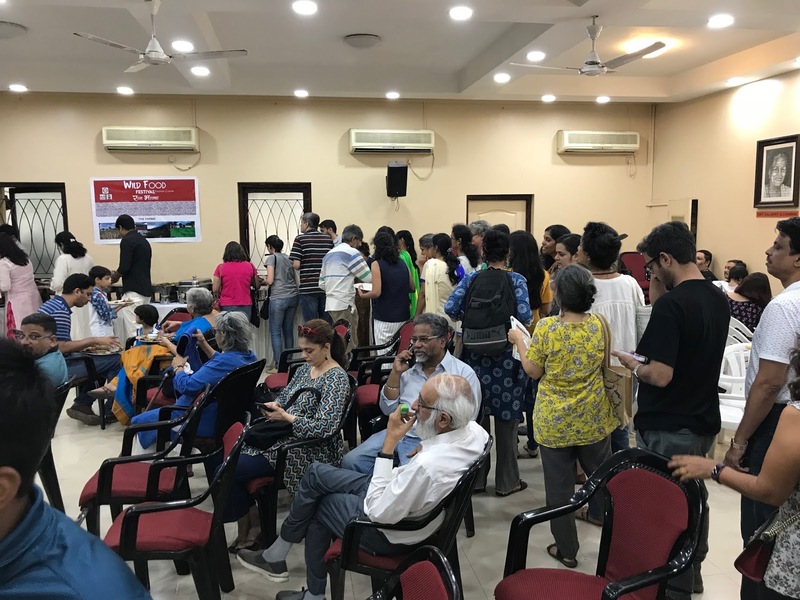 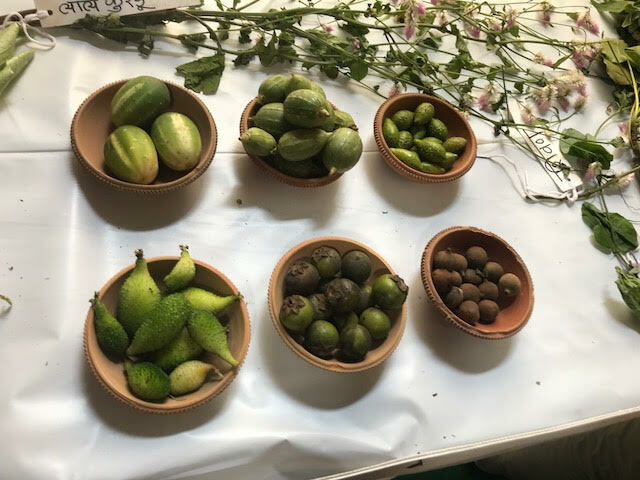 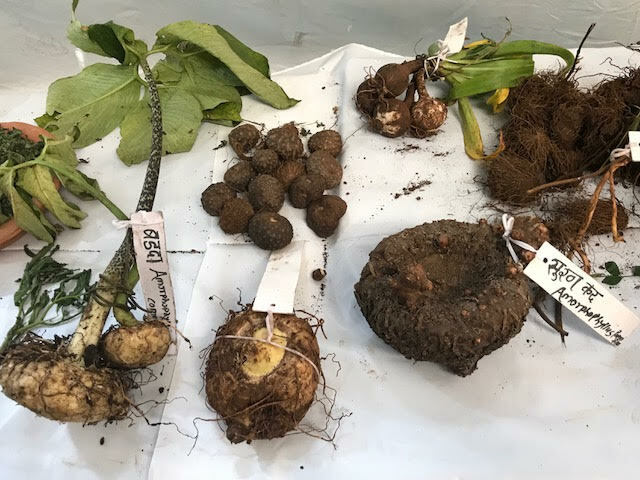 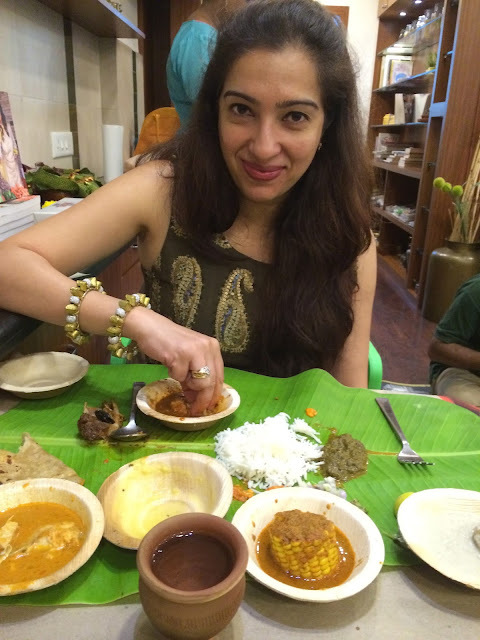 When I saw the announcement for "Wild Foods Festival" by BAIF and OOO Farms,few days ago,my joy knew no bounds.The mountain had arrived in Mumbai! 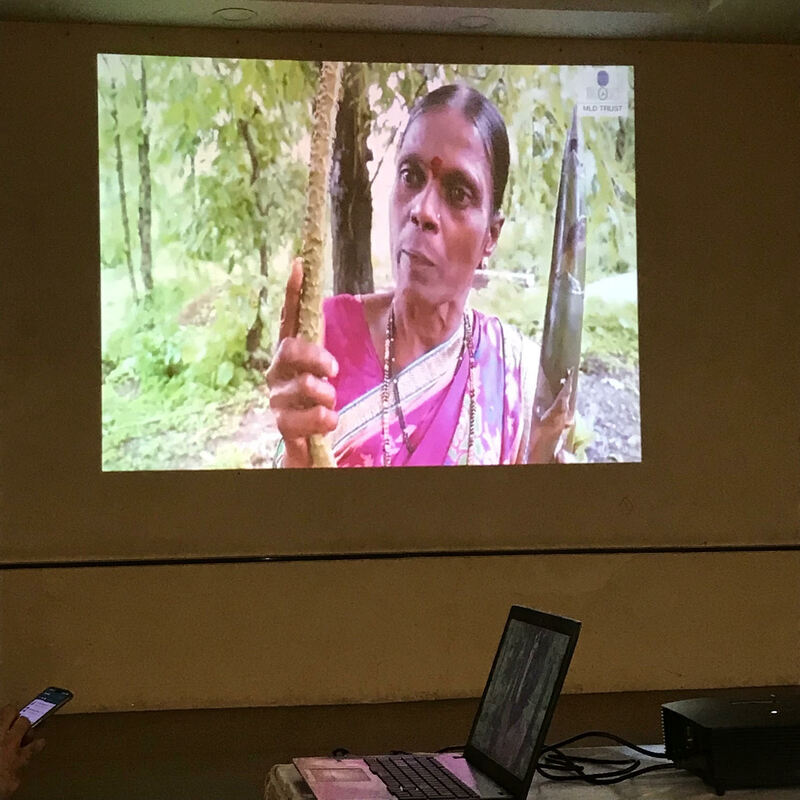 Inspite of the ongoing Ganpati festival,the Rotary Centre hall at Juhu was packed with people of all ages.At first we saw a video on forest foraging and how the locals cooked.I know I want to do this someday.Whether in the forests in Coorg (of which Megha Deokule spoke of at the Archaeobroma (Archaeology of Food) conference some months ago) or Maharashtra,I don't know.But I will. 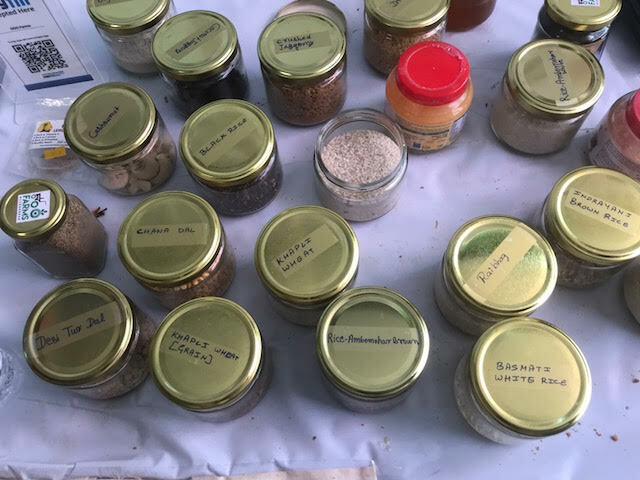 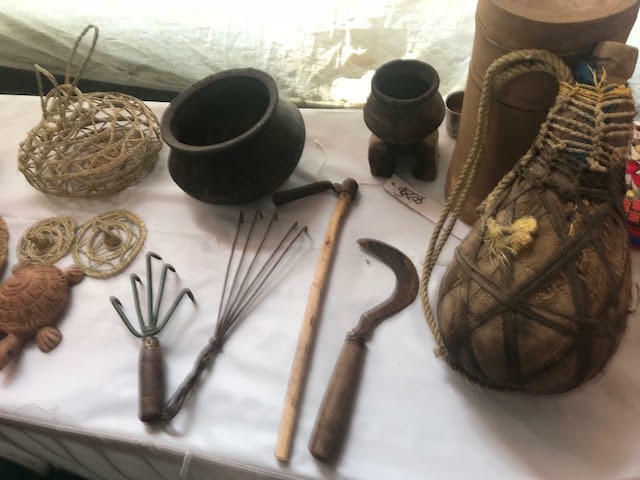 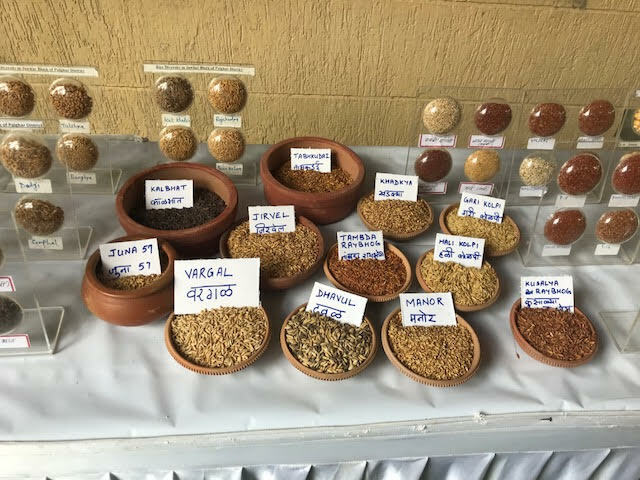 The event had a display of their tools and kitchen utensils.The Mortar and Pestle as well as the Vidi is what they use for cooking.There was also Warli artwork. 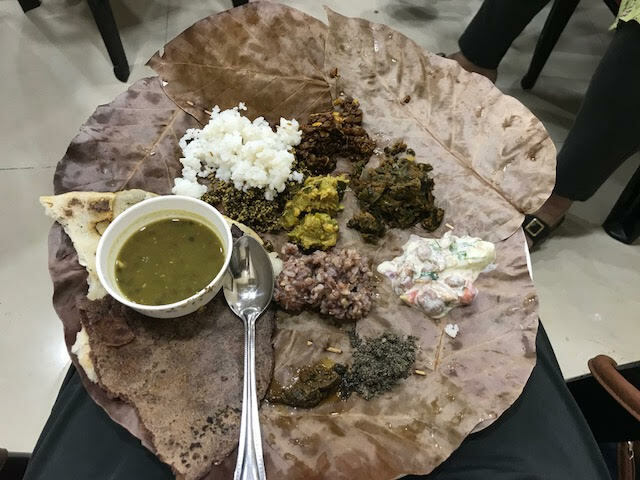 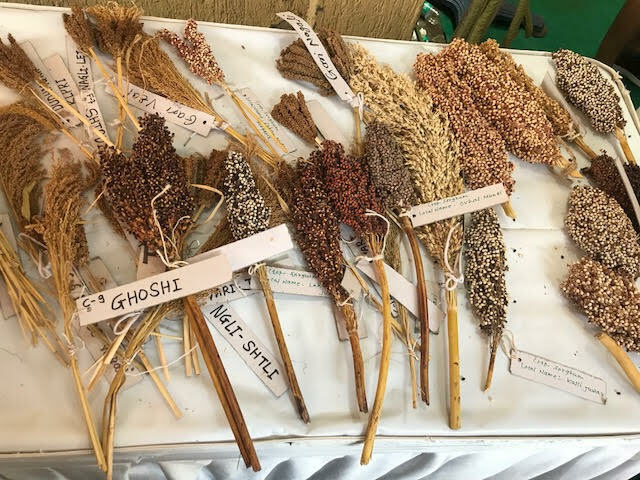 Millets such as Finger millet,Foxtail Millet,Proso Millet,Pearl Millet,Little Millet and Kodo Millet are good sources of nutrition and are indigenous foods. 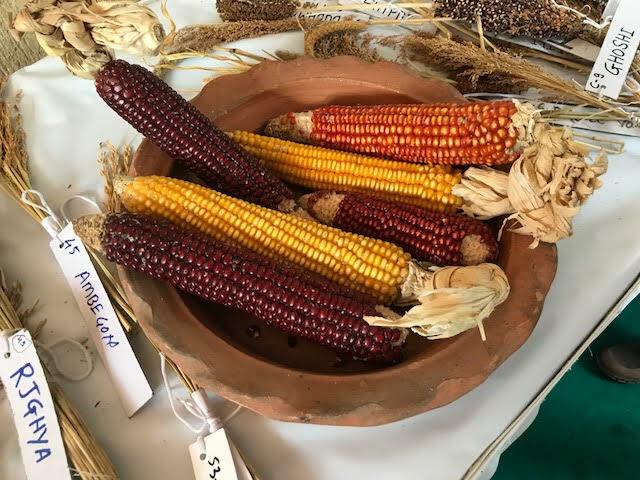 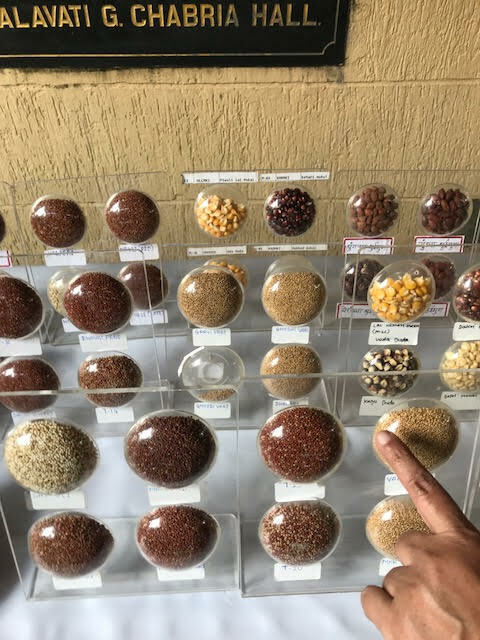 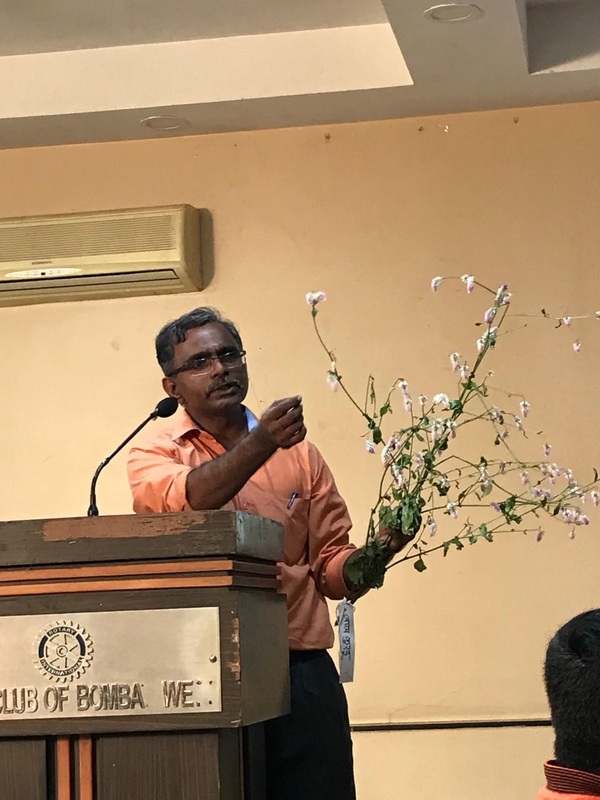 I had read about different colours of corn in America such as purple corn, blue corn and yellow corn I was pleasantly surprised to see multiple colors in corn the exhibition had and to hear from Mr Patil that corn had existed a long,long time in India. 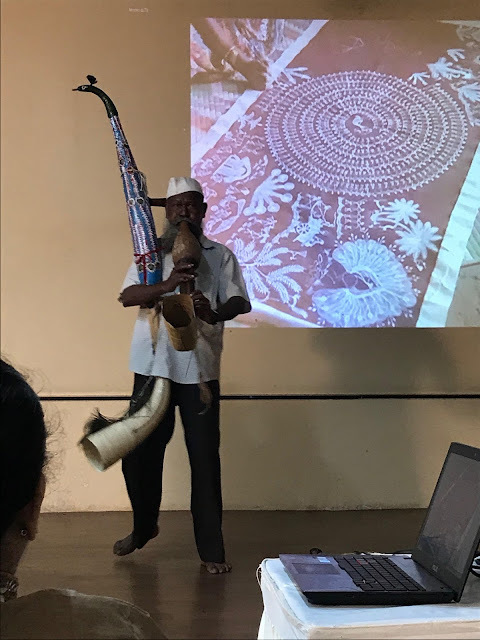 An 82 year old man played an instrument called Tarpa made from Horn.Only a few people know this art.He is from Jawahar Taluka and stated the music is said to make crops prosper. 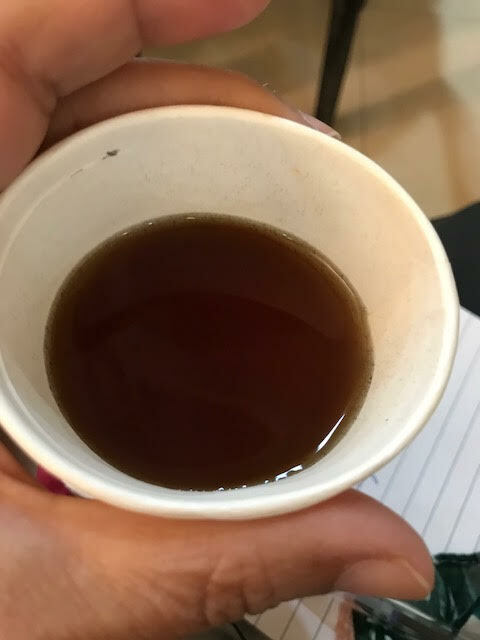 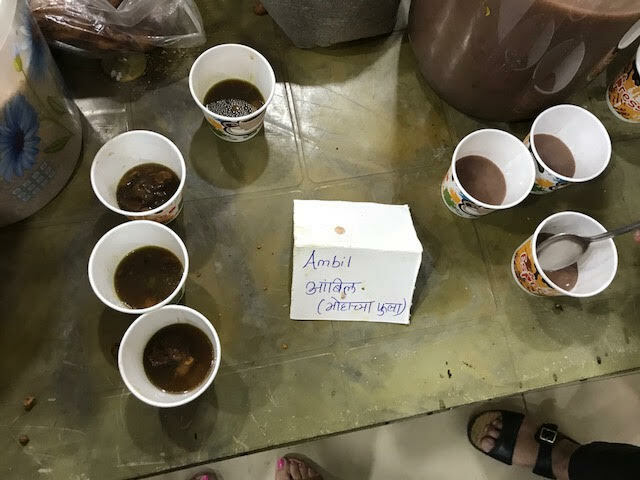 The welcome drink was Wild Tea made with mountain herbs including lemongrass. 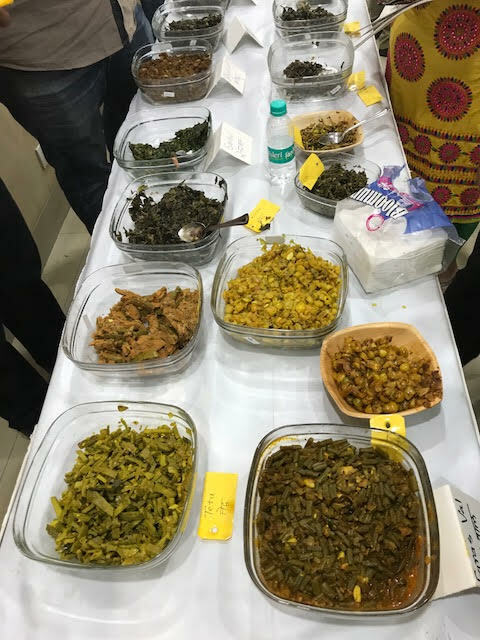 There was a Tasting Station with wild vegetables of all sorts. 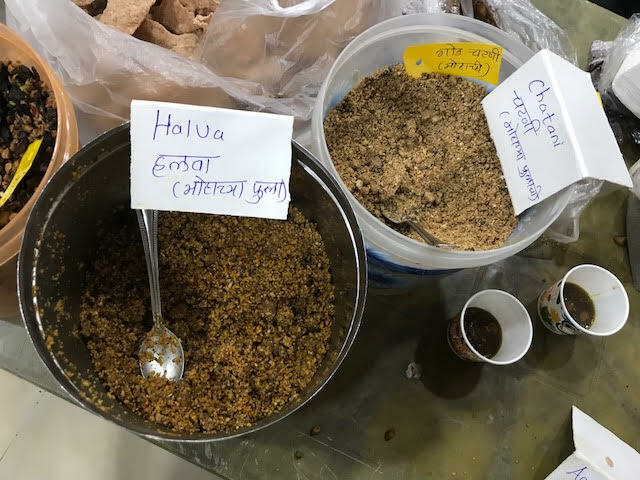 Dessert was Mahua Halwa.....moong dal and mahua flower,wonderfully matched!